Place beyond the parable of the Sower (vv.1-9) and its explanation, it is easy for the significance of this to be lost in the fast-paced narrative of Mark’s gospel. In the parable of the Sower, the meaning of the interim time before the fruits appear has a positive sense: the time of waiting is a time for sowing, an opportunity for seed to be scattered in the field. There is also a teaching that in that interim period there will be barriers, resistance, and problems encountered in the sowing of the seed as it comes to fruition. As in the earlier parable, the sower is not involved with the subsequent growth of the seed. It grows and produces “of itself” (v. 28). As soon as ripe grain appears, the sower comes to harvest the crop. The identity between the sower and the harvester is emphasized in the return of the sower for harvest. There can be no doubt that the harvest is the coming judgment of the world, for the concluding words of v.29 reflect Joel 4:13: Apply the sickle, for the harvest is ripe; Come and tread, for the wine press is full.” Some commentaries wonder about the strangely passive sower perhaps asking too much of a parable to provide the fullest possible description so that there is the fullest possible explanation available to the reader/listener. Of course that rather defeats the purpose of the parable. In any case, this parable is consistent with the previous warnings to ensure that faith increases. The stress in the parable falls less upon the identification of the “passive sower” as God, but more on the sowing of the seed as a messianic work which unleashes mysterious forces operating of themselves in the achievement of the purposes of God. For the attentive listener, this parable highlights Jesus’ mission and what is to be expected. Jesus’ work was sowing; only after a certain lapse of time will there be the gathering of the harvest. The period between sowing and harvest, however, is not insignificant; for in that period something happens. In this connection there occur some remarkable expressions. Clearly in v. 27, the seed germinates and sprouts; it springs up and matures in a mysterious manner that goes almost unnoticed. This is the emphasis behind Mark’s phrase “he knows not how.” It is clearly not by human intervention that the seed grows (v.28); the earth produces fruit “spontaneously.” Mark’s use of the rare word αὐτομάτη is deliberate, and reflects on the characteristics of growth. 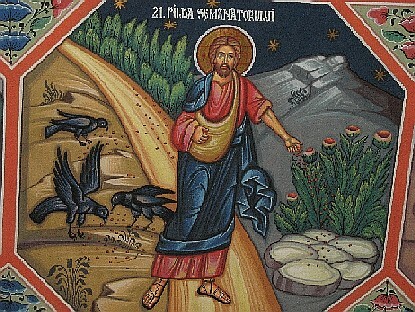 This does not mean that the sower abandons his work, nor that he is uninterested in what takes place, for this is not the point in the reference to his sleeping and rising. It means that the seed must be allowed its appointed course, as the process of growth and ripening advances toward a harvest that is approaching. The sower takes account of the growth of the seed, but he cannot fully understand it. His ultimate interest is in the purpose for which the seed was sown—the harvest; when the grain is ripened, he immediately sends forth the sickle into the grain. These expressions exhibit aspects of the mysterious manifestation of the Kingdom of God in history. It comes mysteriously, by God’s initiative and appointment, without human intervention. This entry was posted in Scripture and tagged Mark 4:26-32, parable of the seed by Friar Musings. Bookmark the permalink.